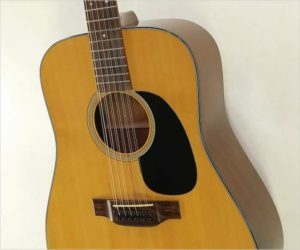 Introduced in 1965, the Martin D12-35 is the 12-string version of the classic Martin D35, visually notable with its three piece Rosewood back. The three-piece design was introduced partly because of simple market forces – larger sized pieces of Rosewood, particularly Brazilian, were becoming scarcer and more expensive. 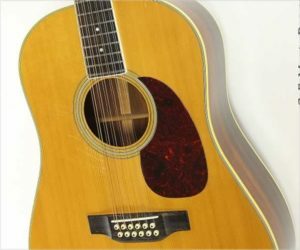 By 1967, Martin was phasing out the use of Brazilian Rosewood, but it appeared on guitars into 1970 until the stocks were completely exhausted. 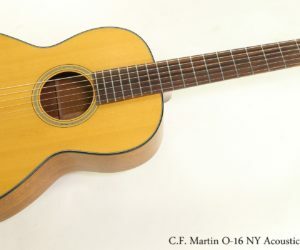 The Martin O-16 NY appeared with the American Folk Boom, and references very early Martin guitars made before 1898 in New York, before the move to Nazareth, PA. The O body size is 13.5 inches wide, and the 12-fret neck has a slotted peg head. As a ’16’, binding only appears on the top. 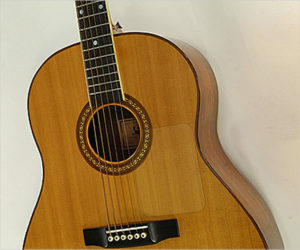 This fine example of the Martin D12-18 was built during 1977, possibly around May. It’s in overall good condition and most importantly, its has just had a neck reset and full setup at The Twelfth Fret Repair Shop. Consequently, it plays very well and should be ready for years of use. The finish is in good shape with just a few small dings and dents, some of which show up in an exaggerated way in the photos due to lighting effects. The Grover strip tuners are an unusual model, and work well.